Kashima Ikkoku Ginji nunome-zogan akinofu mizusashi (Fresh-water jar for the tea ceremony, "Autumn Note", textile imprint inlay on silver) (detail) Autumn plants and insects are depicted in a textile imprint inlay (nunome-zogan) design of gold, tin and lead. Polishing out of parts of the design give an effect similar to sumi-e ink painting, enhancing the restrained but graceful quality of the silver. Metalwork involves the use of various techniques that exploit the tendency of metals to melt when heated and flatten and stretch when beaten. Different periods in history have seen the production of different kinds of metalwork in response to the demands of the times, with skills being handed down from one era to the next. During the Yayoi period (300 BC�|AD 300) copper was used in the making of swords, mirror and dotaku (bell-shaped ritual objects). During the Tumulus period (258-646) items of personal adornment were used as burial goods. 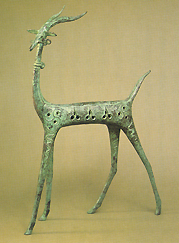 The Nara period (710-794) saw metalworking techniques employed in the production of Buddhist sculptures and ritual implements. Swords and armour were a particular feature of the Kamakura period (1185-1336), while cast iron tea ceremony kettles were produced in large numbers during the Muromachi period (1336-1573). In the Edo period (1615-1868) all kinds of metalwork items were made, including temple bells, garden lanterns and everyday utensils for use by the masses. Uozumi Iraku II Sahari dora (Gong, sahari) Sahari is a copper alloy that emits a beautiful ring when struck. It is a particularly demanding material that requires the highest of metalworking skills. This bell, which is only 1mm thick, was produced by casting followed by hammering. Katori Masahiko Rogin renjumon kabin (Flower vase, rogin with beaded patterning) The serenity of this work derives from the distinctive yellowish colouring of the cast rogin ground combined with the sensitive use of precious stones within cartouches delineated by fine beaded banding. The collapse of samurai rule and the banning of the wearing of swords by the Meiji government in 1876 had a major impact on metalworkers, many of whose livelihoods depended on the making of ornamental fittings for swords. This and the Meiji government's policy of encouraging the mechanisation of metalwork production through the introduction of western technology resulted in the temporary decline of hand-crafted metalwork. However, once traditional Japanese crafts began to be shown at international exhibitions and became important as export items, there was a revival in the fortunes of hand-crafted metalwork, which subsequently developed into a distinctive modern art form. Since the beginning of the Showa period (1926-1989) metalworkers have participated actively in all kinds of exhibitions and new generations of makers have been fostered through a forward-looking approach to the teaching of metalworking skills. Nagano Tetsushi I Hajikihada taguchigama (Kettle for the tea ceremony, cast iron, taguchigama style) The indentations on the surface of this tea ceremony kettle were achieved by flicking casting clay on to the wall of the outer mould. 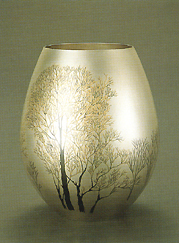 Masuda Mitsuo Kinsai udohanamon mizusashi (Fresh-water jar for the tea ceremony, gilt floral decoration) Line engraving and gilding have been used in the boldly individualistic depiction of the udo plant (Aralia cordata) that decorates this fresh-water jar. 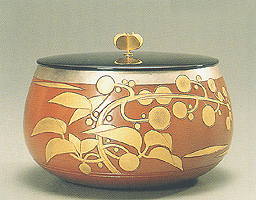 The three major techniques used in metalwork are chukin (casting), tankin (hammering) and chokin (chasing). The first metals used by man were copper, gold and silver. As humans acquired greater knowledge of the hardness and fusion points of different metals, various kinds of alloy were invented. Also, as metalworking skills developed, the range of objects produced increased so that in addition to ornamental items worn about the body, arms, armour and functional objects for everyday use were also made. Gold (kogane), silver (shirogane), copper (akagane), tin (aogane) and iron (kurogane) are known in Japan as the gokin or five metals. They each have distinctive characteristics of texture and colour that make them suitable for metalworking. The technology of extracting metals from mineral ores is called metallurgy. Different metals have different melting points. This means that when mineral ores are heated, different metals can be extracted at the different temperatures at which they melt. It is thought that metalworking began in different regions as people discovered that metals solidified on cooling. The ensuing development of metallurgy techniques that allowed metals to be separated and refined resulted in the discovery of various new kinds of metallic materials. Metalworkers working today either use single types of metal or mix two or more metals to form different kinds of alloy, each of which has its own physical characteristics and colour. 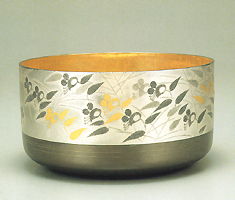 Traditional Japanese alloys include seido (bronze), shakudo (copper and gold alloy) and shibuichi (also called rogin). These are well known both in Japan and the West, where, particularly in the case of shakudo and shibuichi, they are referred to by their Japanese names. 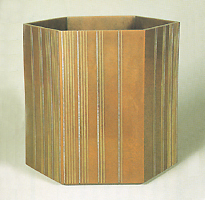 Shibuichi (rogin) = An alloy of 75% copper and 25% silver with traces of pure gold, shibuichi turns grey when patinated. The effect is different from silver that has been deliberately treated to give it an ancient look. The name rogin (lit. 'dusky silver') comes from the distinctive appearance of the crystalline surface. Sahari = An alloy of copper, tin, lead and silver, sahari is frequently utilised in the production of gongs because it produces a good ring when struck. In the tea ceremony, kaigu ('Four Utensils': mizusashi (fresh-water jar), kensui (waste-water container), shakutate (ladle stand) and futaoki (kettle lid rest)) and trays for sweets made of sahari are much appreciated by connoisseurs. Shakudo = An alloy of copper and pure gold with a purplish black glossy surface. When the percentage of gold is 1-5% it is called ukin (black gold), and when it is 7-13% it is called shikin (purple gold). Odo = Brass, which is an alloy of copper and zinc, is categorised into three types according to the ratios of the metals used: 70:30, 65:35 and 60:40. 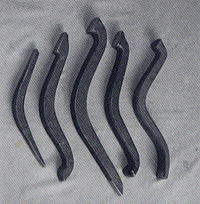 Craft items are made from the first type, which is suitable for hammering and casting. Seido = Bronze, which is an alloy of copper, tin, lead and zinc. When the tin content is high relative to the copper the alloy, which is very hard, is called karakane or hokin. Hakudo = An alloy of 70-80% copper and 20-30% tin. As is known from mirrors made of hakudo, the tin content is higher than in bronze. Chukin involves heating metal until it melts followed by pouring into a casting mould and subsequent cooling at room temperature. Casting differs from other metalworking techniques in that forms are made by pouring molten metal into moulds that have been prepared from an original model made of a completely different material. It allows the creation of far more intricate and complex forms than can be made by other metalworking techniques. Original models may be made of wax, plaster, clay or wood. Wax is particularly suitable for the making of intricate and freely modelled forms and has long been a favoured material. Nowadays metal and silicon are also used. For high quality craft items, casting moulds are made from mane, which is clay slurry mixed with sand. 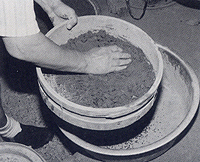 Spent moulds can be broken up and the mane recycled by mixing with water and fresh clay slurry. Casting moulds are classified into three types according to how they are made: komegata (sectioned mould), rogata (lost wax mould) and sogata (sogata mould). Komegata = In komegata or sectioned moulding, the mane casting mould is made from a plaster mould that has itself been created from an original clay model. Once the outer mould has been made, an inner mould is prepared in such a way that the gap between the inner and outer moulds will result in the desired thickness of cast metal. The moulds are then hardened by firing to 700-800��. Rogata = In lost wax casting the mane casting mixture is compacted around an original model made of a special mixture of beeswax and resin. The mould is then hardened by firing to 700-800��, in the course of which the wax melts and drains away, leaving a hollow space in the centre of the mould. 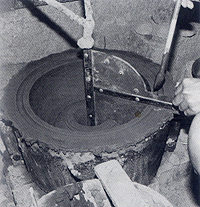 Sogata = A wooden profile template is rotated inside a bucket filled with mane casting mixture to create the outer mould. Once the mould has dried it is removed from the bucket and hardened by firing to around 700��. Melting furnace = molten metal is poured into the mould through a spout located in the middle of the base of the kettle. Surface treatment = after the kettle has been removed from the casting mould it is treated with iron oxide and urushi lacquer, which is hardened by heating (yakitsuke) to form a protective layer that prevents rusting. Takamura Toyochika Chudo kaki "Kanae" (Flower vase, "Tripod", cast bronze) Inspired by ancient Chinese bronzes, this is a highly original work imbued with a simple but powerfully sculptural beauty. 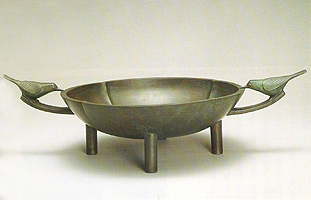 Katori Masahiko Chudo junwaban (Tray with handles and cylindrical legs, cast bronze) The pair of bird-shaped handles on this cast bronze bowl convey a sense of serenity and calm. Points to look out for are the sense of weight and the quality of the surface finish. Sasaki Shodo Rogata chudo okimono "Saika" (Sculptural figure, " Saika", lost wax bronze casting) This is a fine example of the contemporary exploration of the r?gata (lost wax) casting method traditionally used on Sado Island (Niigata Prefecture). Kakutani Ikkei Umanozu shinnarigama (Kettle for the tea ceremony, running horses, cast iron, shinnari style) This cast iron kettle has a number of distinctive features: its overall shape, the shape of its mouth, the form of its handles, the texture of its surface, its colour, and the shape of the lid and its knob. The term tankin is used in Japan today to refer to a range of different techniques that broadly divide into tanzo, tsuiki, shibori and bankin. 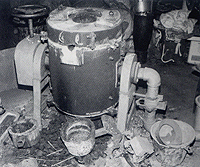 Tanzo (forging) is the technique used for iron. The other techniques are used for gold, silver, copper and alloys. 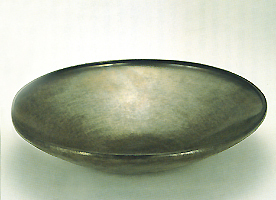 When a solid mass of metal is hammered out, the technique is known as tsuiki. Shibori and bankin are techniques used on sheet metal that has been prepared in advance by mechanical means. Bankin involves the cutting and bending of sheet metal, whereas shibori, which allows the creation of freely conceived forms, involves hammering. Most metals harden when they are hammered and become soft and pliable when they are heated and slowly cooled, a process known as annealing (yakinamashi). These properties are made use of in all tankin techniques except bankin. Haridashi = Creation of the approximate shape, care being taken not to make the metal too thin, using wooden hammers and a wooden block. Shibori = The shape is hammered out with a variety of metal hammers against anvils fixed into a wooden anvil block. Work usually progresses from the base, care being taken to measure the shape as it develops. Curved anvils are used to smooth the surface. Hammering followed by annealing is repeated dozens of times. Narashi = Final shaping of the form and evening out of the thickness of the walls. Wooden block = Wooden blocks with hollows of different sizes are used in conjunction with wooden hammers to create approximate initial forms. Anvil block = Wooden block into which anvils of different shapes and sizes are fixed for the hammering out of shapes. Tankin allows the creation of durable yet lightweight forms with thin walls and sharply defined profiles. Hammering marks left on the surface are a distinctive feature. Tanaka Teppo Tan shibuichi ginban (Bowl, hammered shibuichi ) Shibuichi is a comparatively hard material that requires particular skill in hammering. The liveliness of the hammer marks on this work is unique to shibuichi . 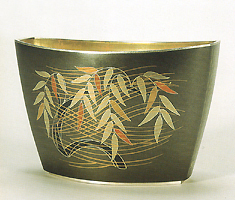 Okuyama Hoseki Gin uchikomi-zogan kaki "Wakame" (Flower vase, "Young Buds", hammered silver with inlaid decoration) The graceful silver body of this work is decorated with a delicately inlaid shikin ( shakudo ) design. 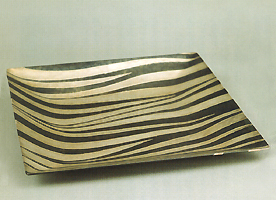 Sekiya Shiro Shakudogin hagiawasezara (Dish, alternating bands of silver and shakudo) This is a fine example of bankin (sheet metal) work in which strips of silver and shakudo have been were soldered together (rozuke) and the edges slightly raised to form a shallow dish. 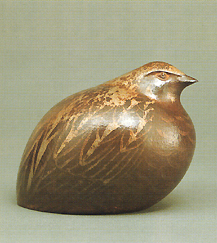 Io Toshio Tantetsu okimono "Uzura" (Sculptural figure, "Quail", hammered iron) Iron has been skilfully forged (tanzo) and patinated to create a realistic rendering of a quail. 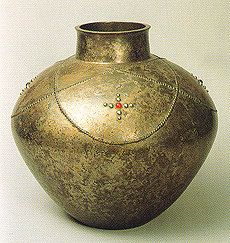 Chokin refers to a variety of decorative techniques such as carving with chisels, piercing, inlaying of other metals and hammered relief patterning applied to hammered metal bodies ordered from tankin (hammering) specialists. Nunome-zogan = The chisel is held perpendicularly and moved across the surface to create an even mesh-like grid. Kebori (hairline engraving) = Hairline engraving using V-shaped chisels. 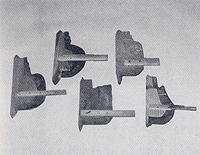 Keribori (kicking-line engraving) = Use of flat chisels to create series of triangular marks. Katakiribori (uneven V-shaped engraving) = Engraving with one edge of the chisel to create lines of different thicknesses and depths in imitation of painted brush strokes. Horikuzushi (carving in the round) = Carving of three-dimensional forms using various types of chisel. Shishiaibori (sunken relief carving) = Carving with an uneven V-shaped chisel of a thick metal ground to create motifs in sunken relief. Nanako-uchi, ishime (surface granulation) = Hammering of small granular indentations into the metal surface to give it texture and added character. Sukashibori (piercing or openwork) = Piercing of the metal body with a chisel or coping saw. Ukibori = Low relief carving. Inlay involves the embedding of relatively soft metals such as gold and silver into a harder ground made of materials such as copper, iron, brass, shakudo or shibuichi. 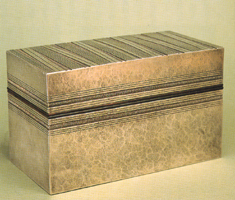 There are a number of techniques, including line inlay (sen-zogan), flat inlay hira-zogan), high relief inlay (takaniku-zogan), polished out inlay (togidashi-zogan) and thread inlay (ito-zogan). In textile imprint inlay (nunome-zogan) thin sheets of gold, silver or lead are hammered into a fine mesh-like grid engraved on to the surface of the metal ground. 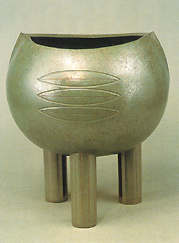 Kanamori Eiichi Chudo zogan roppo kaki (Hexagonal flower vase, bronze with inlaid decoration) A masterful example of raised line inlay work based on an intimate understanding of the casting process used to make the hexagonal body. Naito Shiro Gin saisenmon hako (Box, silver with fine line patterning) The subdued elegance of the hammered silver ground serves as a base for sharply defined linear patterning executed in a combination of kicking-line engraving and surface granulation. When looking at chased work, the points to look out for are size, design, colour, quality of engraving and patination. Kashima Ikkoku Nunome-zogan tsuyukusamon gin shibuichi hagiawase mizusashi (Fresh-water jar for the tea ceremony, silver and rogin ground with textile imprint inlay decoration of dayflowers) Gold and lead nunome-zogan (textile imprint inlay) decoration has been applied to a body made of silver and shibuichi soldered together. A stylish piece of work whose gradated dayflower design is executed in polished out inlay. Kashima Ikkoku Rogin ryuteimon kaki (Flower vase, willow design on a rogin ground) A shibuichi form decorated with a variety of inlay techniques. The last stage in metalwork production is patination, a process crucial to the final appearance of a work. Patination is essentially a matter of oxidising the metal surface. 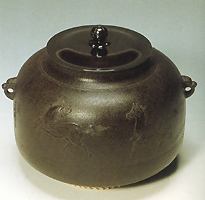 Once the desired effect has been achieved, the object is covered with wax or urushi lacquer to prevent further oxidation and stabilise the colour obtained. Countless patination techniques have been devised over the centuries, making up a body of inherited skills referred to as the 'secret teachings' of metalwork. 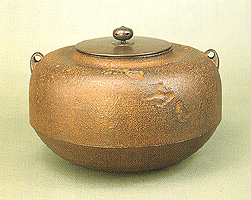 One such technique, for example, involves the intentional corrosion of a cast iron surface by the application of an oxidising compound followed by heating, cleaning and the polishing on of urushi lacquer, which is hardened by firing to about 150�� (yakitsuke). In the case of objects made of non-ferrous metals, the completed work is soaked in a solution of verdigris mixed with copper sulphate heated to 80��. Once the desired colour has been obtained, the work is removed from the patinating solution, rinsed and then, by way of protection, treated all over with ibota-ro, a kind of insect wax. Igurumi = A casting technique that gives rise to unique patterns by means of embedding in the mould a different kind of metal that melts and mixes with the molten metal that is subsequently poured in. Uchikomi-zogan = A hammering technique that gives an inlay-like effect by means of metal of a different kind being soldered on to the surface of an object and hammered into the ground. Kiribame = A hammering technique in which patterns are created by soldering metal of a different kind into spaces that have been sawn out of the vessel body. Tokin (keshi) = Gilding by means of an amalgam of mercury and gold or silver applied to the surface of the metal with a copper spatula. The mercury evaporates when heated, leaving the surface gilded with gold or silver. Nanryo = Literally 'beautiful silver', this refers to silver of very high quality. The term is used in the context of the tea ceremony, where gold is referred to as insu, brass as odo and copper as karakane. Hagiawase = A hammering technique whereby metals of different kinds are soldered together to form the body of the vessel. Joining of the metals is achieved by the use of ginro (lit. 'silver wax'), which is silver mixed with traces of brass. When heated it forms an alloy with the adjoining metals and fuses them together. This is known in Japanese as rozuke. 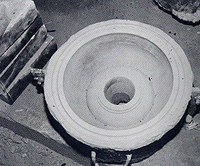 Fukiwake = A casting technique in which different alloys are melted separately and poured into the casting mould at calculated intervals. This gives rise to a unique patterning effect that highlights the qualities of the different alloys used. Mokumegane = A technique in which up to twenty layers of different metals are soldered together face to face and flattened by hammering. Slices are then taken across the endgrain and beaten flat to produce a polychrome marbleised ground. 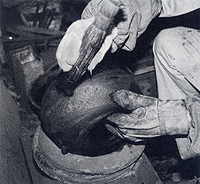 Wazuku = Japanese pig iron made by traditional means of heating iron sand with foot bellows.